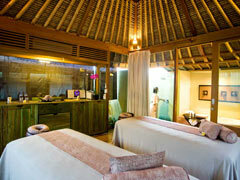 Bali Spa Regain healing and beauty in natural material treatment, “Rei Wellness spa.” This spa aims at the total beauty, and you can take the original menus which use abundant natural material and decrease cholesterol. 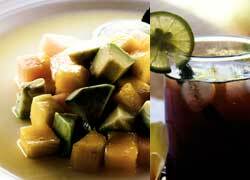 More discount for a group of 2 guests! She was born in 1960, east Java. She has German and Javanese parents. She has great talent to help pepole since she was young, and she often try meditation. 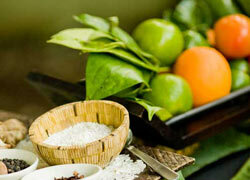 She learned and aquired many kinds of treatments such as Indian Ayurvedic treatment, Thai Massage, Shiatu. 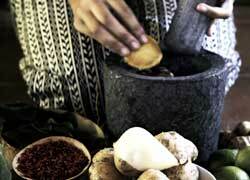 Moreover, she has knowledge about herbs. 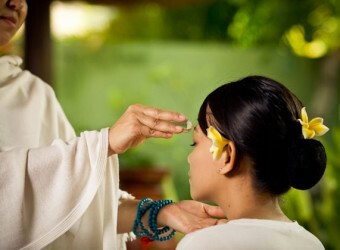 The treatment by the famous Reiki trainer in Bali, Rulia. 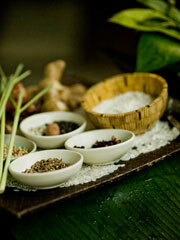 Ayurveda is an organic treatment from India. Energy which goes the center of the body called "Chakra" will be reset to bring back healthy body and mind. Body massage with warm oil ease the tension of the muscle and shirodhara puring oil on the forehead can lead you to the stressless world. 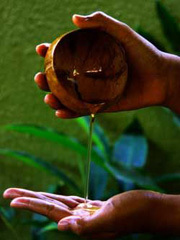 Indian medical treatment, Ayurveda can relax your whole body by pouring warm herbal oil on the forehead. Crystal Bath in the course rebalance energy can cure speepless, headache and stress. Special course including Ayurveda and Reiki Healing. The Orange Sensation is the ultimate spa experience that leaves the skin with a vibrant glow. Massage for softer skin with plenty natural green tea product. Drawing inspiration from the traditional Balinese remedy of boreh that is used by rural farmers to warm the body and relieve muscular pain, this ritual gives insight into the island’s unique healing heritage. This energizing ritual restores balance to the body through stimulating vital reflex zones on the palms of the hands and soles of the feet. Pickup free in Kuta, Legian, Seminyak, Kerobokan, Jimbaran, Nusadua, Benoa, Sanur, area. 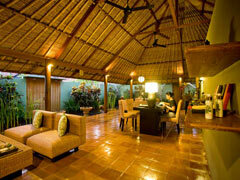 For one person and for Ubud, Kerobokan, and Tabanan area, offer transfer service with extra charge. THere are menu for children age over 15. If you required room for each person(2people guest), it will be exdtra ＄10/1person charge. 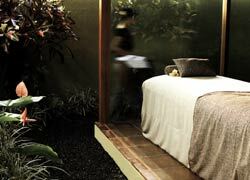 The spa has a high ceiling with lovely Balinese style alang-alang. My whole body got relaxed after Ayurveda treatment. I heard that Reiki healing is also very popular. I think I would also like to experience that menu next time.